The following is a guest post from regular contributor, Yuni at Love Your Abode. Hi everyone! 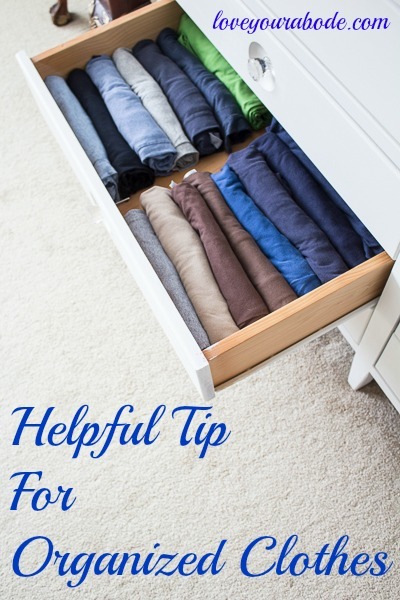 Today, I’m sharing an easy tip on how we keep our clothes organized as a family of five. In January of this year, I went through a major editing phase in our house. I went through our books, home decor, kitchen items, toys, and all of our clothes. I purged a great deal and got rid of a lot of excess. If it wasn’t bringing value to our family then most likely it was donated or passed to someone else who could use the item. It felt great! There is something about decluttering that makes you feel refreshed and allows for you and your home to breathe. It felt overwhelming at first so I just chose to do it little by little whenever time would allow. 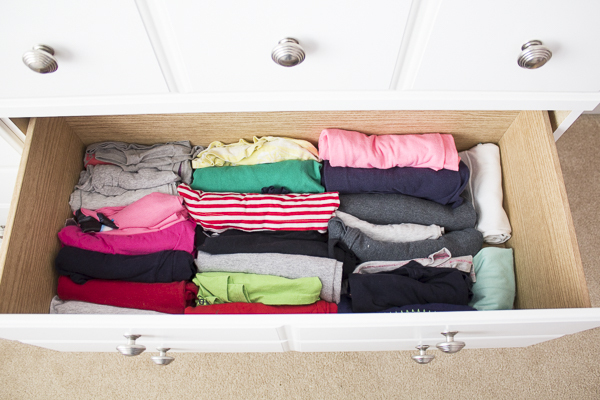 When it came to clothes, I started organizing them by going through each family member’s drawers. I literally took everything out of each drawer and assessed each item of clothing one by one. 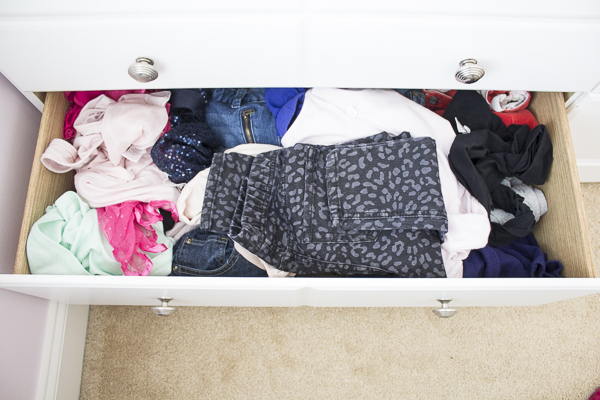 I got rid of clothes that no longer fit my kids, threw away ones that had basically been worn out, and it also allowed me to assess what items I needed to buy for them in the near future. This was also a great time to place all of my kids’ gently used clothes in bags to send to my niece and godson. 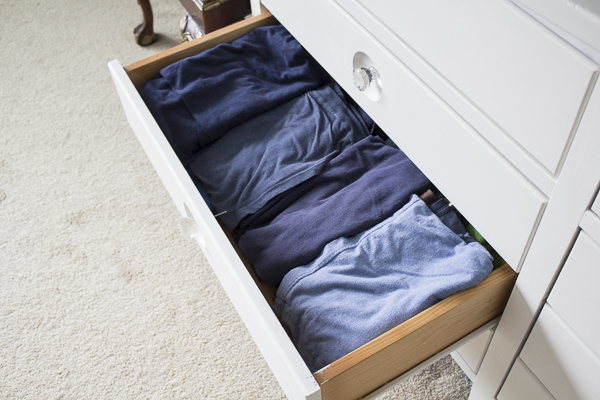 Until recently, we folded all of our clothes that went into the drawers. Well, at least we tried to keep it folded but eventually, it would sometimes look like this. One day, I asked my 8 year old daughter why she was always wearing the same shirts when clearly, there were so many other ones that she never touched. It dawned on me that she would only retrieve shirts and pants that were placed on the top of the inside of the drawers. The clothes underneath basically never saw the light of day. Her shirts and pants would get laundered and placed right back on top and therefore, she would wear the same ones again and again. This also happened with my 6 year old son since he dresses himself. 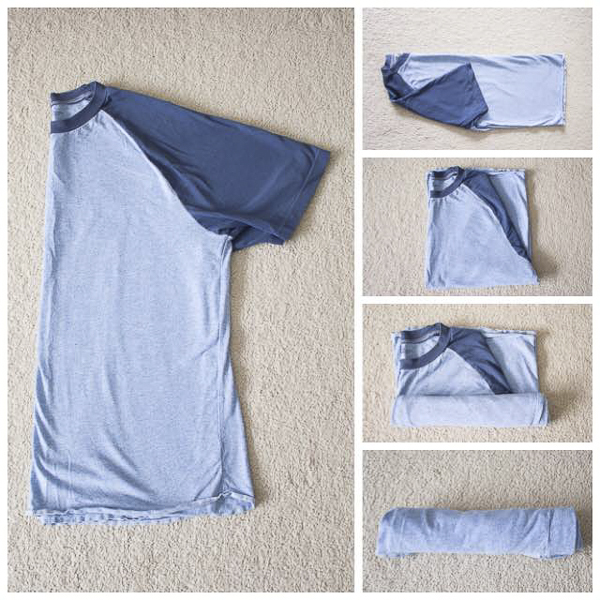 I know people will argue that rolling clothes may not be that much better or more efficient than folding but personally, changing to this method has been so much better for our family. Rolling them allows us to see all the clothes in that particular drawer. After comparing both methods, I realized it also saved space in our drawers. It’s not magazine worthy but I wanted to show you a real life photo of what it looks like today because my daughter has been keeping it in this manner for some time now. She has all her shirts rolled and now we can see all of her inventory. Here’s an example of all of her leggings and shorts. She has been doing a great job as far as I can tell. 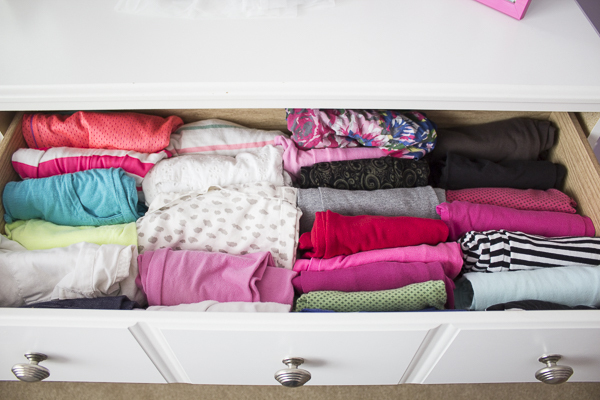 I noticed she also reorganized some of the drawers and moved her leggings in here from her pants drawer. Clearly, she has caught the organizing bug and I don’t mind it one bit! Heres’s an example of my husband’s drawer full of folded shirts. Can you tell his favorite color is blue? He did graduate from Michigan! The same issue occurred for us too just like the kids. Some of our clothes sat at the bottom for months and months. You can see the simple diagram that shows how I rolled all of our shirts. After rolling and placing them in drawers, I noticed there was a little more space as well. Even better, we can now see everything in plain view. I always saw my husband using this technique for his suitcase when traveling for work but never thought to do it at home. After rolling our clothes since January, we have easily converted to this organization method. 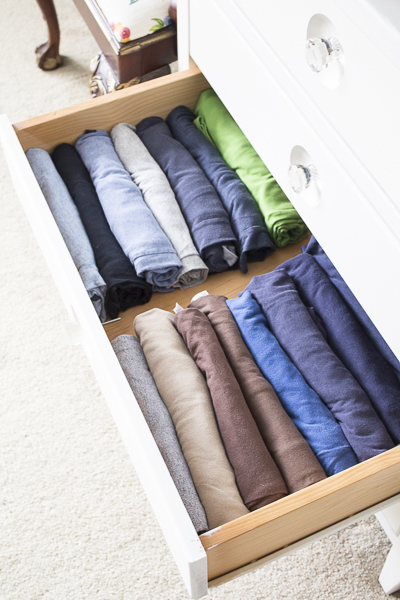 How do you organize your clothes in drawers? Do you fold or roll? Yuni is married to her high school sweetheart and is a stay at home mom to three precious miracles. She is passionate about Jesus and loves creating a home with purpose. You can find her at Love Your Abode where she shares her love for DIY, organizing, cooking, and interior design. She loves gathering, feeding, and celebrating people. I’m just like your children where I have a lot of clothes but I only wear a few because they are right on top. The only time I dig around and get clothes from the back is if I need to dress up. I think I will try your idea of rolling clothes and see if it works better for me! Yes, that’s exactly what happened with all of us! I’m totally guilty of this as well. I’m so glad to hear you’ll try this tip out! Thank you! Hi Robyn, I’m so glad you are inspired by the post. I hope it helps you as much as it has helped us! Thank you so much for your comment! This is something we do to keep us organized and clothes worn through. I find that we buy so much that we never wear items because we keep going to our favorites. I struggle with this concept because I don’t understand how you keep the shirts from looking wrinkle and needing to be ironed before you wear them. What am I missing? I fold in either 4ths or 6ths with the logo showing on top. That way you know exactly what shirt it is just by glancing.